Myanmar is an ancient and mysterious land; the many peoples, cultures and customs that stem from this country are still being learned about and shared. Now is a unique time to visit Myanmar, and on this tour you will meet the colourful and deeply religious tribes that inhabit its mountainous border regions - and are becoming accessible to foreigners for the first time. Arrive in Yangon and head to the Buddhist heart of Myanmar – the magnificent Shwedagon Pagoda. Wander downtown during the balmy evening and explore the many restaurants and bars now cropping up in this increasingly cosmopolitan city. Fly up to Bagan and begin the day exploring the Ananda pagoda, dating from the 12th century and famed for its gilded sikhara tower at its peak; choose from bicycle, car or horse and cart for your preferred mode of transport around the temples. Later in the day, climb the Gawdawpalin or Bupaya pagodas for perfect sunset panorama views of the temples and plain. Drive 8 hours west of Bagan to the small Chin mountain town of Kanpetlet and wander around the simple homesteads and churches of this quiet rural backwater; you will stay at one of the eco lodges higher up the mountain. The next day you make the straightforward hike up Mount Victoria (known as Nat Ma Taung in Burmese or Khonuamthung in the local Chin language), witnessing beautiful mountain vistas and variety of colourful flora on the way. The next stop is the Mindat, dramatically perched on a mountain ridge. Here, you will find members of the indigenous Dai, Upu and Ya tribes, of which the older womenfolk all have distinctive full facial tattoos. Explore the local market and mountainside villages and then return to Bagan for the chance to explore some more temples and enjoy some Myanmar wine over dinner by the pagodas. Fly to Mandalay and visit the last royal palace of the Konbaung dynasty, recalling the days of Thibaw and his queen, Supayalat, before they were expelled to India by the British. Just to the south of Mandalay, take a stroll down the longest teak bridge in the world, the iconic U Bein bridge in Amarapura. The town of Amarapura is full of textiles stores and small metal works factories, where you can watch master craftsmen cast Buddha statues in bronze or visit a weaving factory to see how fabrics are made. Take a horse and cart around the quiet meandering roads of Inwa, which once made up a powerful kingdom’s capital city. Across the Irrawaddy River from Mandalay, the Mingun Bell is reputed to be the heaviest and largest working bell in the world. If you’ve worked up a hunger wandering around Mingun and its massive unfinished stupa, reward yourself by purchasing some freshly steamed corn on one of the many roadside stalls – it’ll be the sweetest you’ve tried. 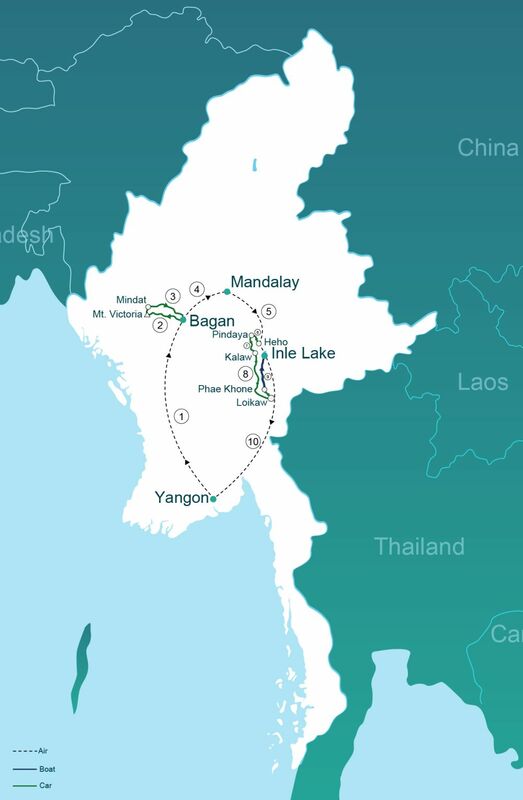 Depart Mandalay to Heho by plane, then to Pindaya by car. Feel refreshed by the cool mountain air after the heat of the lowlands, and discover this scenic lakeside town with its large number of Danu and Pa-O tribal peoples in the vicinity; fiercely independent and frequently found flying their own distinctive flags, they are also enormously warm and welcoming. Take the chance to explore the caves filled with thousands of golden Buddhas at Pindaya and then head on to the bustling hill station of Kalaw, an old colonial outpost with a large population of Nepali guides whose families remained here after the Second World War. From Kalaw, drive south to Loikaw, the picturesque and sleepy capital of Kayah State that was until recently off-limits to foreigners but is now slowly opening up; the town is home to a number of interesting rock formations with pagodas at their peaks, and the surrounding mountains are host to caves and opportunities for trekking. The local tribal culture is one of the most fascinating aspects of this area, and of particular interest are the local Kayan women, who have traditionally worn golden neck rings and are sometimes referred to by outsiders as ‘giraffe neck’ or ‘long neck’ women. Although the practice is dying out, many of them will be happy to tell you stories of their younger days. On your return northwards, wind your way through virgin jungles and cultivated hillsides to reach the village of Phae Khone by car, and then take a scenic trip on a long tail boat to Inle Lake for second leg of the trip. If you go for the superior hotel option, you will be taken to your hotel on the lake (standard hotels are in the characterful town of Nyaung Shwe). There will be time in the afternoon to relax or for sightseeing around the lake to see the fishermen of the local Intha tribe employing their traditional one-leg rowing technique. After breakfast the next day, visit the ancient lakeside stupas at Indein and see handicrafts in Nampan village. If the time is right, see the floating markets that are a photographer’s dream. Finish up your day with sunset wine tasting at Red Mountain Estate vineyard and then dinner on the lakeshore. Depart Heho to Yangon and, after checking into your hotel, wander around the bustling streets and try some sweet laphayet (Myanmar tea) at one of the many tea shops and pair it with some fresh ee char kway, a deep fried dough snack to be really naughty on the last day of your tour. There should also be time for those last minute presents at the famous Bogyoke Market before you head home. Would you like to extend your tour to the beautiful and relaxing Ngapali Beach? Our travel advisors will be able to arrange this for you, along with any other travel, accommodation or activity requirements you may have. Just fill out the ‘Any further queries’ box after you have clicked on the ‘Book Tour’ button.